There are several types of balloons that are used for scientific research:The rubber of neoprene balloon is used for vertical soundings. The balloon is filled on the ground. As it ascends, the gas expands and stretches the neoprene until the volume of the balloon has increased 30 to 200 times its original amount. When it reaches its capacity, the balloon bursts and the instruments float to the ground under a small parachute.The zero-pressure plastic balloon is usually made of polyethylene. The Ultra Long Duration Balloon 'pumpkin' balloon. This is a super-pressure balloon, which means there are no vent ducts and has to be strong enough to withstand the higher pressures. It is partly filled with gas while on the ground, which gives the balloon a teardrop shape. As the balloon ascends, the gas expands and fills the balloon, making it spherical. The balloon has a valve that automatically discharges excess gas when it reaches its predetermined altitude, so it remains in place. When the sun sets and the gas cools, the volume decreases and the balloon descends to the ground. A zero-pressure polyethylene balloon at float altitude. The appendages are the vent ducts that allow the excess lifting gas to escape to prevent the balloon from popping. 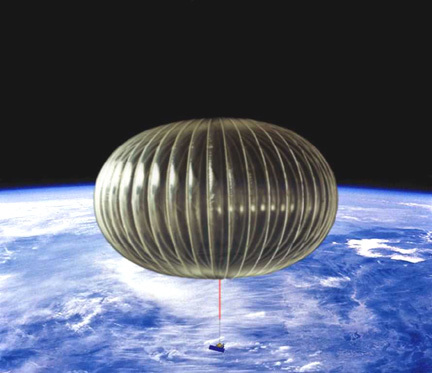 The super-pressure balloon is made of Mylar or polyethelene and can withstand very high internal pressure. This type of balloon is sealed to prevent the release of gas as the balloon rises. When the balloon reaches the altitude where its internal density is the same as that of the atmosphere, the gas in the balloon has become pressurized. Although the internal pressure of the gas will change based on the temperature of the surrounding atmosphere, the balloon's volume remains the same. The balloon will remain at a particular altitude as long as the internal pressure is greater than the external pressure. 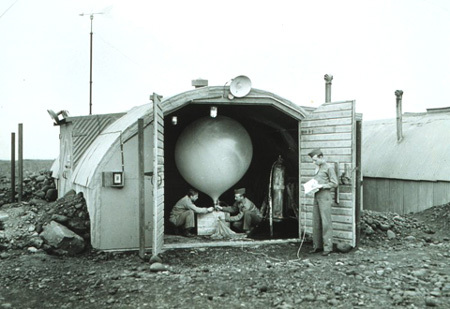 Army Air Force meteorologists prepare to launch a hydrogen-filled balloon. The balloon transported a radiosonde that transmitted back to a ground station. The radiosonde measured temperature, humidity, and pressure. This instrument was used until just before the end of World War II. It was sent up from a post in Iceland and was important for obtaining shipping and forecasting information for planning European operations.